Associate Professor of the Department "General and Applied Mathematics"
Senior Teacher of the Department "General and Applied Mathematics"
Summary. We investigated the dynamics of changes in the size of an isolated population on the basis of P.H. Leslie's model. To implement the computational experiments applied programs were written in the environment of Delphi 7.0. The population size was predicted on the basis of three scenarios: 1) on the basis of the classical discrete model of P. Leslie, i.e. without taking into account the epidemic factor; 2) on the basis of the P. Leslie's model, taking into account the epidemic of the first type; 3) on the basis of the P. Leslie's model, taking into account the epidemic of the second type. Key words: population models, P. Lesley's model, epidemic of the first type, epidemic of the second type, survival and fertility rates of age groups, prediction of population size, adequacy of the model. Аннотация. Была исследована динамика изменения численности изолированной популяции на основе модели П. Лесли. Для реализации вычислительных экспериментов составлены прикладные программы на языке Object Pascal в среде Delphi 7.0. Численность популяции прогнозировалась на основе трех сценариев: 1) на основе классической дискретной модели П. Лесли, т.е. без учета фактора эпидемии; 2) на основе модели П. Лесли с учетом эпидемии первого типа; 3) на основе модели П. Лесли с учетом эпидемии второго типа. Ключевые слова: модели популяций, модель П. Лесли, эпидемия первого типа, эпидемия второго типа, коэффициенты выживания и рождаемости возрастных групп, прогнозирование численности популяции, адекватность модели. Introduction. At present, mathematical models for studying the dynamics of populations are widely used in ecology. The mathematical results obtained in the study of population dynamics models serve for practical purposes of the management of biotechnological and natural systems. It is known that the initial population models were constructed on the basis of unreasonable data and unrealistic conditions. For example, the formulation of the Fibonacci problem does not differ from entertainment tasks [1, p. 148]. It is the first mathematical model of population dynamics that has come down to us and is given in the book "Liber Abaci". According to this model, exponential growth of the population is observed, and the solution of the Malthus problem also leads to unlimited growth, or exponential extinction of the population [2, p. 14; 3, p. 34]. Such decisions are not adequate to real situations. Over time, population problems were studied more seriously and with the addition of real conditions. There are models that reflect reality more adequately. An example is Volterra model of a change in the number (or density) of different populations [4, p. 31]. Another example is the Leslie model [3, p. 207], which can be said to be a generalization of the Fibonacci model, taking into account the survival and birth rates of age groups [5, p. 43-46]. This model was proposed by the American biologist P. Lesley in 1948 [6, p. 213-245]. It is convenient to consider the distribution of the population by age groups to describe the change in the population size over time. The first group includes all individuals under the age of one year. The second group includes all those individuals that are not in the first group, whose age is less than two years, etc. Let the first age group include individuals, the second includes individuals, etc. It is assumed that all individuals die out in the -th age group, where is some fixed natural number. The total number of individuals in a population is equal to the sum of . There is a birth rate for each age group. If the birth rates for the considered age groups are respectively, then the annual offspring due to the presence of the -th age group with the number is equal to. Thus, the annual offspring throughout the population is equal to the sum. At the same time, individuals belonging to the -th age group in a year will go to the -th age group, and individuals belonging to the n- th group will die out in a year. Therefore, in a year the distribution of the population by age group will be as follows. The model becomes much more accurate as a result of introducing in addition to the birth rates also the survival factors [1, p.152]. Survival factors, as well as fertility rates, are derived from long-term observations of populations of this species. It is noted, for example, that lizards are characterized by a weak dependence of the on the i, that is, approximate equalities are satisfied. Elephants and whales are characterized by a decrease with an increase i. Penguins have a maximum of the for the mean values of i. An extremely small value of the for the initial values of the i is observed in some species of fish, etc. It is believed that if in the current year the i-th age group has the number, then in the next year the -th age group will have the number. Here, the distribution of the population by age group in a year will be . The problem (1) - (2) is solved by an algorithmic method. Below, new modifications of Leslie's problem are considered, in which it is taken into account that after a certain time, the number of the population decreases as a result of the epidemic. In this case, by introducing additional parameters, the obtained problem is solved by an algorithmic method. 2. The problem of population size with the epidemic of the first type. This task takes into account the epidemic that occurs when the population size increases, as a result of which the mortality of individuals increases, and their birth rate is reduced. If the population exceeds a certain number, then the survival rates of are reduced times, and birth rates are reduced by times. 3. The problem of population size with the epidemic of the second type (gradual epidemic). In this problem, a gradual epidemic is considered, in which the functio is introduced. The function can be or depending on the value of t. If there is a significant excess of population than the number, then reduction of population size occurs abruptly. If the population size is little higher than the number ,the population size is reduced moderately. In the considered problems it is required to calculate the parameters, and also, i.e. the number of each age group, and the number of the entire population. Solution method. The tasks were solved by an algorithmic method. Results of calculations. For solving of the considered problems software was developed in the programming language Object Pascal in the Delphi 7.0 environment. In the figures in column P, the given initial population numbers by age groups are introduced. In column B, the specified birth rates are entered. The survival factors are entered in the column S. In the line V, the number ν is introduced, which is the critical value of the total number, more of which there is an epidemic. In lines K1 and K2, coefficients k1 and k2 are introduced, respectively. The field Time specifies the time interval t through which the population size should be predicted. Thus, according to model (1), an infinite population growth occurs, and according to model (2) population dynamics is an oscillatory process, and according to model (3), the number gradually stabilizes around a certain equilibrium number. Received some other results are presented to the attention of readers. According to the initial data P0 =(100, 120,150,110,80); B=(0,5; 0,6; 0,7; 0,6; 0,4); S=(0,9; 0,9; 0,8; 0,7; 0,0); v=1000; k1=1, k2=1; tmax=10, after reaching the peak, the population is gradually decreasing. According to the initial data P0 =(100, 120,150,110,80); B=(0,5; 0,6; 0,7; 0,6; 0,4); S=(0,9; 0,9; 0,8; 0,7; 0,0); v=1000; k1=2, k2=1; tmax=10 a vibrational increase in the population is observed. According to the initial data P0 =(100, 100,100,100); B=(0,1; 0,2; 0,3; 0,2); S=(1,1,1,1) ; v=1000; k1=1, k2=1; tmax=3 the population is extinct. Conclusion. P. Leslie's model takes into account age groups, multiplication and survival factors in the study of population problems. This model, being an important computational method in biometrics, also allows considering a number of other factors, for example, epidemics. In the article the results of consideration of various modifications of the P. Leslie model are presented: without taking into account the epidemic, taking into account various epidemics. The results of unlimited growth that do not correspond to the real world, oscillatory change, stabilization of population and extinction of the population are obtained. Gordin V. A. Differential and difference equations: What phenomena they describe and how to solve them: tutorial. - M.: Publishing house of the Higher School of Economics, 2016. - 531 p.
Bazykin A.D. Mathematical biophysics of interacting populations. M.: Science, 1985. 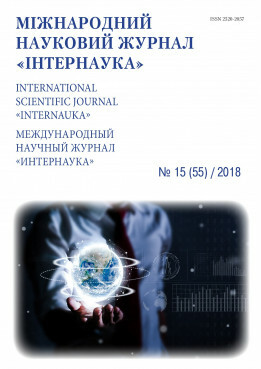 - 181 p.
Alekseev V.V., Kryshev I.I., Sazykina T.G. Physical and Mathematical Modeling of Ecosystems. - St. Petersburg: Hydrometeorological publishing, 1992. - 368 p.
Volterra V. Mathematical Theory of Struggle for Existence. M.: Science, Moscow, 1976. - 288 p.
Riznichenko G. Yu. Lectures on mathematical models in biology. M-Izhevsk, Publishing house "Regular and chaotic dynamics", 2002. - 236 p.
Leslie P. H. On the use of matrices in certain population mathematics. Biometrika, 33:183. – 212. – 1945.